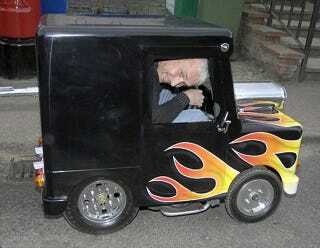 A British builder has transformed a 39-inch-high by 26-inch-wide childrens coin-operated ride into a road-legal automobile, wresting the title of "Worlds Smallest Car" from the still-microscopic Peel Trident. More Peel Action! 49ccs On Super 8! We're not familiar with "Postman Pat" but we're betting our British readers know the character's little red mail truck, the one Perry Watkins used as a basis for his latest world record car. You may remember Perry from his previous records for the worlds lowest car, the very cool Flatmobile, for this one he wanted to aim for the smallest car ever built. After finding the fiberglass coin-operated child's ride on eBay, it was stripped of its cartoon postman and other unnecessaries and placed atop a go-kart chassis with 150cc engine. He then added lights, windshield wipers, washers, turn signals and other various other bits until it was ready of a Ministry of Transportation inspection, which it amazingly passed, and certified as the worlds smallest car.